So, you got a new game. You watched reviews and how-to-play videos and maybe even read a few articles about it. After playing the game a few times you quickly move on to another one. I find myself doing this quite a bit. Does anyone else have this problem? My husband and I got into the gaming hobby in the last few years after some friends introduced us to games like Small World, Agricola, and Kingsburg. My addiction to board games really started when we found the YouTube series TableTop. I binge watched the entire first three seasons in just a few days. These days I keep up to date with a few board game channels including The Dice Tower and Man vs. Meeple. I can never get enough! I still enjoy those older games on occasion, but the games I think about and want to get to the table are the ones I’ve just purchased. There are, however, a few exceptions. Terraforming Mars is one. I will play Terraforming Mars solo or with my husband. We have yet to play it at a higher player count than 2, but once I find the right group to play it with, you can bet I’ll have it ready! Another game is Scythe. I am horrible at the game, but I still enjoy figuring out the different strategies and trying desperately to beat my husband. As with Terraforming Mars, we’ve only played it with 2 players since our gaming group is still new to the hobby and I don’t feel they are ready just yet for these heavier games. They’re getting there though! These are two games that I will play any time and we’ve had them both for a few months, so the “newness” has worn off. The games we’ve recently purchased that I am itching to play are Villainous, Century Spice Road: Golem Edition, and Space Base. We’ve played these a couple times, but I want to play them again. Villainous has been played two or three times already and I can feel myself slowly being ok to not play it again for a little while. We’ve only played Century Spice Road and Space Base once with our game group so I want to get them back to the table and fast! Is this normal? How can I enjoy a game during its play, yet still be okay with shelving it for a while? Azul, for example, is one we bought a few months ago and played quite a few times; however, I’m ok with not shelving it for awhile. Kingsburg is another example. We recently purchased the 2nd edition since it was one of the first modern board games introduced to us. We loved it so much that I wanted to play it all the time. Now that I have, I’m fine with it staying on the shelf. It doesn’t mean I don’t like Azul or Kingsburg – I do! I love both games and if someone wanted to play them, I’d be willing and even happy to, but I no longer feel that burning desire and need to play them. Is it me or is it the game? Why are Terraforming Mars and Scythe exceptions? Could it be the strategy involved and that I haven’t delved deep enough into these two? Perhaps games like Azul are strategically simple enough that, after a few plays, I’ve seen all I need to see and I can move on. Will this happen with Spice Road or Space Base? As I mentioned earlier it is already starting to happen with Villainous in spite of my enjoyment for it. Maybe it is the length of the game or the complexity? Azul is a pretty short, light game and you can play it multiple times in one night. Kingsburg is slightly longer but not too heavy; however, Scythe and Terraforming Mars are much longer and require quite a bit of brain power so you will probably spread out your game plays of them and not get tired of them as soon as you would a shorter, lighter game. Could it be the group I play with? Don’t get me wrong, I love my group! We have a great time, but if I were to play with different people it may bring new life to a game. Recently I went on a work trip and had a game night with co-workers. 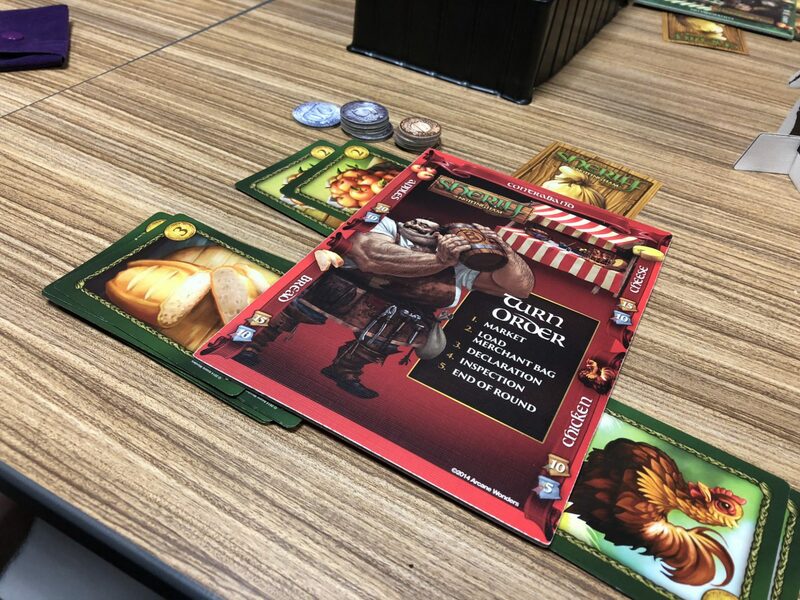 We played 5-Minute Dungeon, Sheriff of Nottingham, and Codenames. I had never played 5-Minute Dungeon and thoroughly enjoyed it. 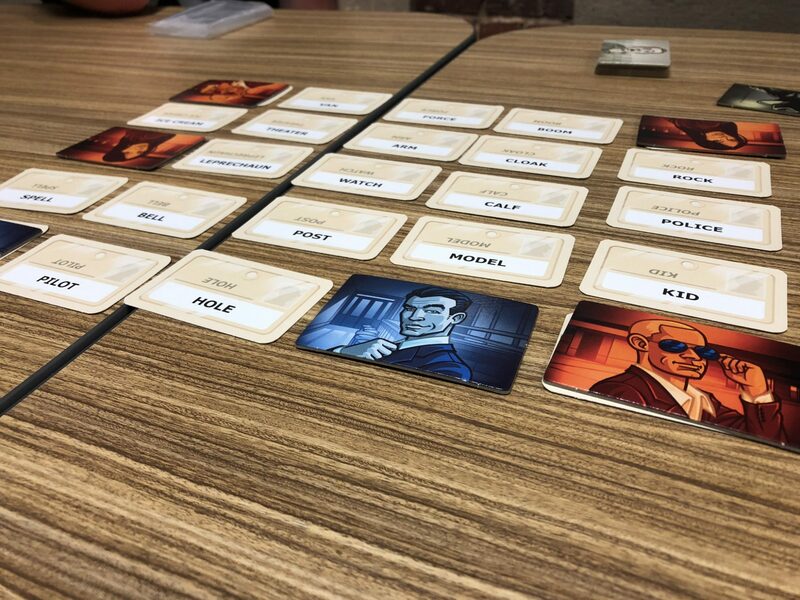 Codenames, even though it isn’t my favorite, was fun to watch my co-workers create clues based on who was on their team. Sheriff of Nottingham was also quite enjoyable and even though I’m not good at it, we still had a blast. However, I can see these games getting stale especially if you play with the same people. I also had the opportunity to play Azul, Splendor, and Century Spice Road: Golem Edition with different family members who were in town. Since they don’t necessarily like the heavier games I thought these would be good games to introduce them to. They had a great time and I enjoyed watching them learn the strategies, seeing it click, and even beating me quite a few times. My Mom liked Azul so much she actually bought it for herself! Most of the time I’m the one who picks out the games that we play. Now, before people think I’m selfish, I’m the one in our group that knows the most about board games so our group generally lets me pick out the games. But, if other people pick out the games then different games will be played before I start to tire of them. The problem is, my group would actually rather I pick out the games. I tried getting other people to make the choice, but ultimately it remained up to me. My husband did pick out a few games that had been sitting on our shelves for a while and we had a good time, but overall, I still want to go back to the games that we just acquired. I guess what I’m finding is that I get so excited when I get a new game that I just want to play it over and over to the point that I get sick of it. Playing with different people does put some new light into the game but after 2 or 3 plays of it I’m good to move on to something different. There are some exceptions, but because those games are heavier they don’t see the table as much as I would like. So, I don’t have a perfect solution for this, and to be honest, I’m ok with that. Sure, my budget would benefit greatly if I could stay away from Amazon or local game stores, but I like having a variety of games in my collection and introducing them to friends and family. Some of those “old” games will be brought out again (especially if someone hasn’t played it yet), but for now I’m happy playing out “The Newness”. For an alternate viewpoint on this topic, see what Nathan Baker has to say about why you should limit your board game collection. I think you summed it fairly well actually. Some games have the instant classic feel to them, while other are simply great in the moment. Will people play Century Spice Road a decade from now? I doubt it. Splendor, I think will last the test, as it is just great at what it does. Scythe has great strategies and enough that can be different just via the modules available and player count. I feel like Terraforming Mars will not last as long as others, but they sure keep cranking out expansions. Azul….I. On the fence about, but given how accessible it is and pretty to look at, it may have legs. I may not want to play Azul all the time, but I will not back if somebody brings it out and I still enjoy it. I’ll admit that I’m curious where Century Spice Road will be in a decade especially with Eastern Wonders coming out this year and I believe they have another addition coming out next year as well. Will that keep people playing Century? Will be interesting to see where that lands. Terraforming Mars is one of my favorites, but if they had kept just the base game, I agree that it probably wouldn’t have too much staying power, but those expansions… man, I want to play it now!! I agree that wearing out the newness is a problem in this hobby. I think a lot of it stems from the depth (and lack thereof) that most games have. This is especially common in light/gateway games. 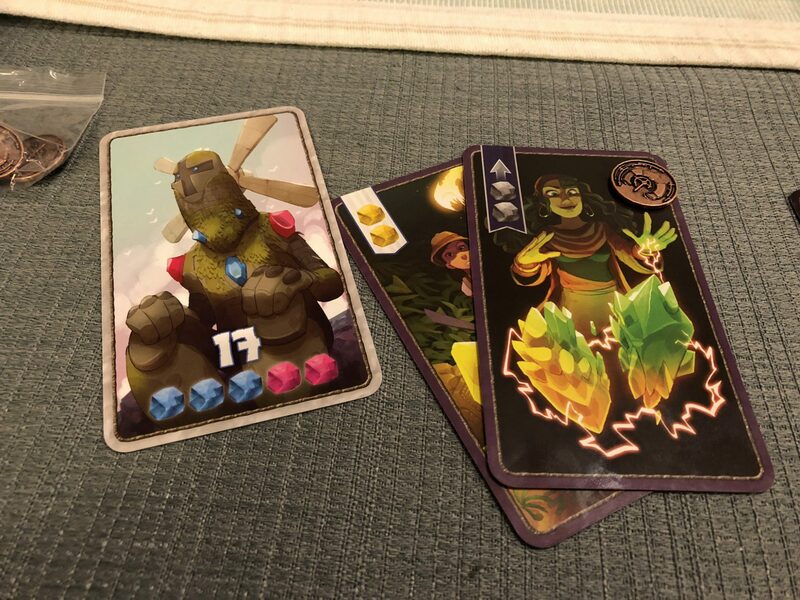 I thoroughly enjoy Sushi Go, Kingdomino, and Guillotine etc and will play them if someone requests them, but I don’t think about them otherwise. A few plays in and you’ve seen what there is to see. The true draw from a game is when you play it and then the next day you’re walking around thinking about what you could’ve done differently and what strategies you want to try the next time you play. You can feel yourself learning from mistakes and actually improving at the game. I think Scythe and Terraforming Mars both have that, which is why you keep bringing them out. Century Spice simply doesn’t. 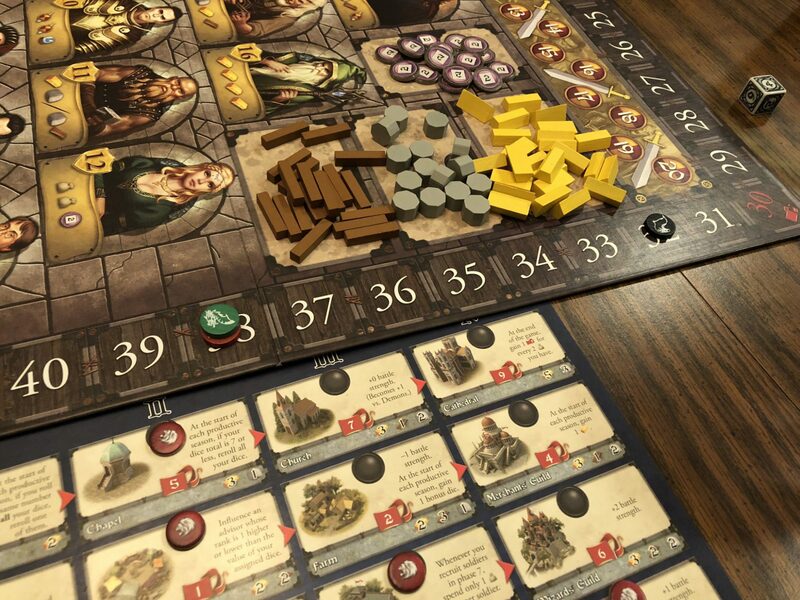 If you look at older games that are still highly regarded today, like my favorites Tigris and Euphrates, Caylus, El Grande, and Puerto Rico, they all have a simple ruleset that lends itself to a lot of freedom in how you play. The players keep the game interesting because they can bring different strategies that must be dealt with. As great as Azul and Splendor are, I don’t think they have that. Games get stale eventually, some faster than others. When people play a game a lot of the enjoyment comes from the act of learning. Games with a steep learning curve, while intimidating, will ultimately offer a deeper more rewarding experience. Consider the fact that people have been playing Go and Chess for centuries. In conclusion, I didn’t proofread this so hopefully you can make some sense of my ramblings. What is the game in the first picture please?